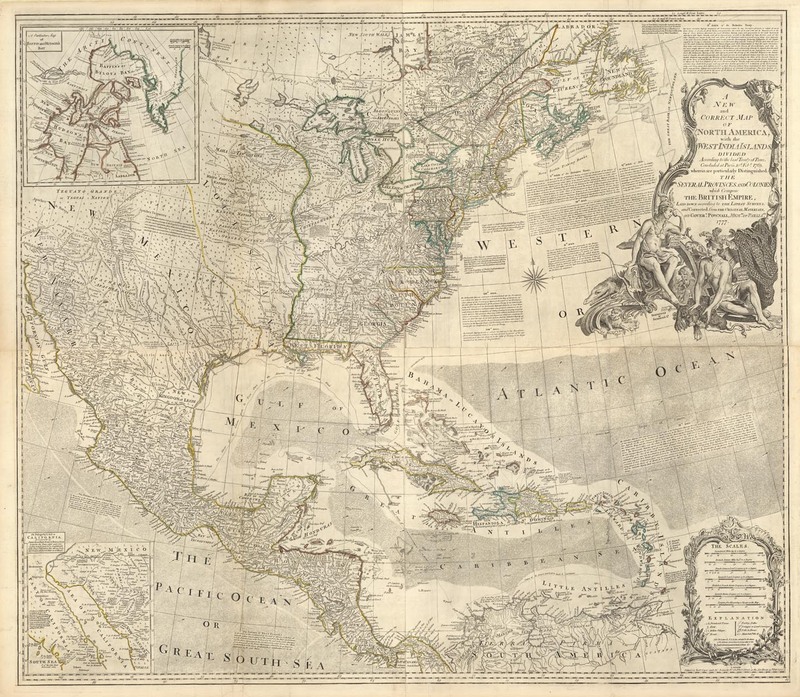 A NEW AND CORRECT MAP OF NORTH AMERICA, WITH THE WEST INDIA ISLANDS. DIVIDED ACCORDING TO THE LAST TREATY OF PEACE... PARIS, 10TH FEBY. 1763, WHEREIN ARE PARTICULARLY DISTINGUISHED THE SEVERAL PROVINCES AND COLONIES, WHICH COMPOSE THE BRITISH EMPIRE. Copper plate engraving with outline color, 1777. Two section map, each. 20 x 44 3/4" (508 x 1163 mm). Publisher : London, Printed and Sold by R. Sayer and J. Bennett, Map, Chart, and Print Sellers...	Plates 5 and 6 from Thomas Jefferys' "The American Atlas: or A Geographical Description of the Whole Continent of America..." The map, when joined together, centers on the Florida panhandle and extends to include the Mexico and New Mexico area, Canada, the Caribbean, and part of Venezuela. An inset of “A Particulare Map of Baffin and Hudson’s Bay” appears in the upper left corner. The inset in the lower left shows Kino's explorations in lower California which led to the discrediting of California as an island myth. An “Explanation” by the scale measurements in the lower right corner notes Provincial Towns, Forts, Indian Villages, Roads, Trading Paths, Portages or Land Carriages, Falls in Rivers, and Mines, Salt Pitts &c. Title continues: "Concluded at Paris, 10th Feby. 1763, wherein are particularly Distinguished, The Several Provinces and Colonies, which Compose the British Empire, Laid down according to the Latest Surveys, and Corrected from the Original Materials, of Goverr. Powenall, Membr. of Parliamt. 1777." 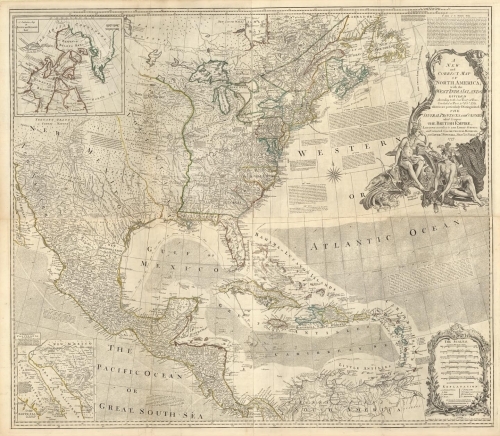 Originally issued in 1755 by Bowen & Gibson, there are at least twelve various issues or states of this map. Over a period of years, there were extensive alterations in the map, title, and cartouche. This particular issue is the sixth or “f” with the date of "15th Feb. 1777" as described in "Comparative Cartography" by Stevens & Tree.